Attention Acupuncturists, Chiropractors, M.D.s, Estheticians and other healthcare business owners who are ready to achieve more masterful results, be on the leading edge, and increase their income. Learn how this highly effective, practical application of Vibrational Medicine can elevate your clinical results and create new streams of income in your practice. Microcurrent and color light therapy has advanced to become the leading edge for alternatives in expanded pain relief, holistic healing and non invasive facial rejuvenation. If you are a healthcare or esthetic practitioner who desires to tap into one of the most powerful growing trends in energy medicine, this technology is for you. In fact this is one of the best times for leaders and innovators in complementary and alternative medicine and holistic rejuvenation to create and maintain growing practices. With this new technology you will set yourself apart from your peers and have an easier time growing your practice with highly motivated patients. In fact today’s clients are not only more educated but they are motivated to seek out those professional services using the latest and greatest blends of technology, science and natural therapies. Boomers want effective and transforming results — and will pay for them. Want more details? Fill out the Information Request Form and choose from 8 informative white papers you can download for free. Microlight therapy has that power to transform. It is transforming client results and professional’s bottom lines so effectively that it almost seems like magic. A unique combination of dual streams of microcurrent and specific colors of light creates a “high-low Hz” biological resonance effect, targeting specific body tissues and systems. This goes beyond anything previously possible to quickly relieve pain, help healing and recapture a beautiful image for anti-aging rejuvenation. Both light energy and subtle electrical energy are transported throughout the body via chains of protein molecules. These energies are passed through the crystal-like connective tissues of the body, the substrate for the meridian system. This produces rapid relief of difficult pain conditions and accelerated rehabilitation after injuries or surgery. It is also producing remarkable gains for patients with degenerative neurological conditions such as M.S., peripheral neuropathy and post-stroke. The same technology provides the most effective and popular form of Facial Rejuvenation! Microcurrent is unparalleled for pain relief, promotion of collagen production, non-needle acupuncture and accelerated rehabilitation after injuries and strokes. Color Light enhances cellular and organic functioning, ATP production and facilitation of various mind-body healing processes. There is extensive research available on the physiologic effects of microcurrent & color light. By adding color to the specific frequencies known to work in microcurrent you can improve the flow of energy and information that travel rapidly through the body. A wide range of applications gives Microlight therapists the competitive edge due to the quality and quantity of services they can offer. Best of all, there is no need to spend time and resources to figure out how to make the best advantage of these versatile and transforming therapies in your practice. Dr. Darren Starwynn, supported by the Eastwestmed research team, develops new effective treatment and evaluation techniques for all applications of Microlight — from technology and the most effective pain relief and internal medical protocols to business support solutions. Every member of the Microlight family receives the benefits of all this valuable knowledge along with the satisfaction of using the most most advanced and effective technology. Our team is ready to answer your questions and send any additional information to help you understand Microlight Therapy. This includes an informative Intro to Microlight webinar, available upon request. Just fill out the Information Request Form with your questions or treatment protocols you are interested in receiving. You will be able to download your choice of informative white papers containing Microlight treatment protocols, research studies, business plans to implement new Microlight services and more. The root of pain is multi-factorial. There are usually physical, emotional and even Spirit-level causative factors at work. This is why many chronic pain conditions can be so difficult to treat with conventional methods. Even acupuncture, with its well-deserved reputation, often delivers only limited results for patients with complex pain and neuropathic conditions. 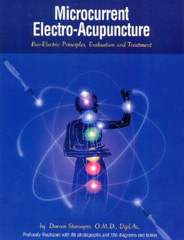 Vibrational medicine offers the most powerful and effective treatment methods for these kinds of challenging patients. Microlight therapy is a practical and user-friendly application of vibrational medicine that is amazingly effective. Microlight uses an innovative combination of frequency-specific microcurrent and color light chromo-therapy that will empower you to bring relief and healing to your patients who have not found it before. 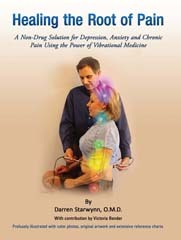 Based on over 30 years of research and clinical experience Dr. Darren Starwynn has created an easy-to-learn system for treating very difficult issues using a series of very brief Microlight techniques. This system is called Pain Mastery Sequence Therapy, and Dr. Starwynn teaches it through his webinars and live seminars. Modern medicine can help rehabilitate post-stroke patients, but results are very limited for those with significant impairments. There are few options that offer much hope for people with neurologic degenerative conditions (NMD) such as multiple sclerosis, Parkinson’s and peripheral neuropathy. The next video shows some of these techniques used by Dr. Starwynn to treat a man with right sided paralyis after a devastating stroke 18 months prior. Thousands of years before modern medicine “discovered” the psycho-somatic causes of illness Traditional Chinese Medicine texts taught that excessive emotions are a prime cause of somatic disease. It also showed how emotional imbalances such as depression, anxiety and mania could be rooted in imbalances of the internal Organs. There are acupuncture and herbal treatments prescribed to help relieve depression and other psycho-emotional conditions. Ancient Ayurvedic medicine from India included therapies using colored light or gemstones to correct physical and emotionally-based disease conditions. A new method called PNE Balancing is creating even more powerful results than what has been offered by these traditional methods. Integrating the wisdom of ancient Chinese and Ayurvedic medicine with modern technology, PNE Balancing offers rapid results for modern patients suffering with debilitating stress, depression, phobias, addictions and more. PNE Balancing is a powerful tool to help modern people dealing with pervasive stress and complex body-mind issues to heal themselves. It is excellent method to boost results for psycho-therapists, acupuncturists and holistic healers working with psycho-emotional issues. A staggering 68.8% of the population of the United States is considered overweight or obese (Flegal et al., 2012). While billions of dollars a year are spent by Americans for weight loss few systems offer lasting results. Debi Weiss, L.Ac., RN has developed a superior system for promoting long-lasting weight loss and improved physical and emotional health. She calls this system the Ideal Weight Program™. Debi’s studies of Functional Medicine and Traditional Chinese Medicine (TCM) have led her to the conclusion that both systems are rooted in the same holistic healing principles. By integrating Functional Medicine with frequency-based vibrational therapies she has demonstrated surprisingly good results with overweight clients. This system is taught at selected East-West Seminars events. Here you can hear excerpts from a webinar interview with Debi Weiss, in which she describes the program and how to develop referral relationships with physicians. Making the link between treatment efficacy and growing your business is more important than ever in today’s climate. When you can deliver results which makes clients truly grateful to you, your business takes on a whole new dimension. When you are able to treat clients in a very effective way, they become your best source of new clients as they spread the word about you. If you’d like to create an army of delighted clients who will promote your business, you need to have the right tools for the job to deliver superior results, even with your most challenging patients. It’s no secret that delighted patients tell their friends when they address long lingering health problems or when they turn the clock back years using noninvasive facial rejuvenation. What is less well known is that energy medical technology exists today which can help you provide results that will delight even your most challenging patients. When they are delighted by your services, your business changes dramatically. Ask yourself when was the last time you effectively healed a challenging patient? How many of your last 10 clients floated out of your office…. truly impressed by the treatment they received? What impact would dozens of these clients each month have on your practice? The fact is, that with the right technology, you CAN deliver results that will surprise and delight your clients…and YOU! For the typical practitioner, investing in the Microlight system is an investment in your reputation and the effectiveness of your treatments which will make your business grow by leaps and bounds as word spreads from your delighted patients! Today, the Microlight system is used for a multitude of different purposes. Although the practitioners uses of the machine vary widely, they all have one thing in common…they are amazed at the efficacy of the unique combination of gentle electrical pulses and healing light energy in treating a wide range of increasingly common complaints and esthetic conditions.